In the Wee Small Hours/Where Are You? Play Me Hearts and Flowers Your browser does not support this audio format. How Did She Look? Your browser does not support this audio format. I'm Forever Blowing Bubbles Your browser does not support this audio format. How About Me? Your browser does not support this audio format. Stan Edwards, or "Mr Manhattan," as he is known, is in a class by himself. Stan is the last of the rare breed of Jazz Singers from his generation. When you listen to each track on this record, you are listening to the honesty and depth of the man himself. 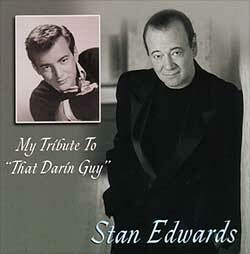 Stan does more than just sing a song; he becomes the song as if each tune is autobiographical. His voice is more powerful than a locomotive and just as gentle as rose petal. Listen to this record and you will hear what America's most beautiful music is all about. In my opinion, Stan Edwards is king. King of Popular Song. He is the best singer remaining, in the tradition of the true greats - Sinatra, Bennett, Darin, etc. I have seen him perform live many times, and it was my pleasure to witness such a great performer. And now everyone has the chance to hear him sing by purchasing his CD that is as good as it gets. 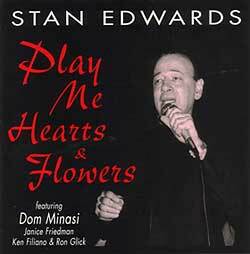 In the tradition of Sinatra's In The Wee Small Hours Stan Edwards Play Me Hearts and Flowers is a truly great concept album. And Stan Edwards is truly great. But don't just take my word for it, take a listen for yourself. The Mac Medley Your browser does not support this audio format. You Are The Reason I'm Living Your browser does not support this audio format. Bill Bailey Your browser does not support this audio format. That Funny Feeling Your browser does not support this audio format. "That Darin Guy is the much anticipated follow up to Stan Edwards critically acclaimed 1997 CD "Play Me Hearts and Flowers" (available on original cast record (0C9650) it's not an easy task to select over a dozen tunes associated with a performer as diverse as Bobby Darin. Stan has lovingly managed to serve up a hearty sampling of Darin-fare sure to delight ardent fans of both singers and casual listeners alike." "If you listen to the lyrics and imagine that Edwards believes what’s he’s saying, then it’s not Darin you’re hearing, but a new male singer destined to make more music – that’s all!"